Aventurine Quartz Necklace 24.61ct Handmade Jewelery-5030, Size: 38 C.m. Owing to the presence of expert professionals, we are able to offer our clients an exclusive range of Druzy Quartz Stones Fashion Necklace & Long Pendant . These Druzy Quartz Stones Fashion Necklace & Long Pendant are very appealing in look and are available in various sizes and colors. Rose Quartz Gemstone Necklace with pink gemstones is a symbol of royalty and style. Owing to the vast industry experience of this domain, we are offering a huge collection of high-quality Titanium Quartz Statement Necklace to our valued clients. 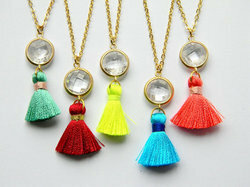 As per the needs and requirements of our clients, we are involved in providing Rose Quartz Drop Necklace. Rose Quartz favorite of most…in an oval shape with Silver as a base metal. It will make you more beautiful. 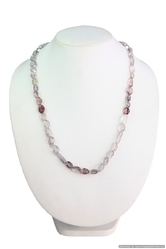 We are a leading Manufacturer & Exporter of Rose Quartz And Freshwater Pearls Necklace to our valuable clients.